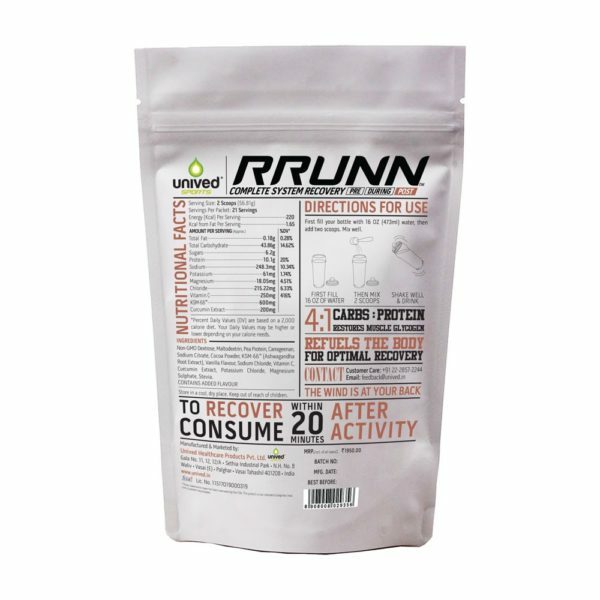 RRUNN™ Post is a recovery drink mix of carbohydrates and proteins in a 4:1 ratio, along with BCAAs, electrolytes, vitamin C, KSM-66, and curcumin extract. Consuming this within 20 minutes of your activity, ensures complete system recovery, prevents cramps & muscle breakdown, and promotes protein synthesis & muscle development. 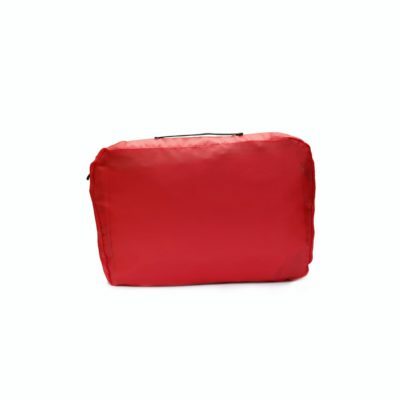 There are no artificial colors, no preservatives, it’s gluten-free, and vegan. It is available in coco vanilla flavor. The window of 20 minutes immediately after your activity is when your body is most susceptible to wear and tear, but also the most receptive to a recovery drink formulated with the ideal ingredients. When the right nutrients are consumed within this crucial 20 minute window, the body is amenable to directing these nutrients towards recovery processes aiding the muscle damage sustained during your activity that needs to be repaired and the body needs the nutrients to promote the building of new muscle. If you do not recover completely, you are more susceptible physical and mental damage, which negatively impacts your training and performance. 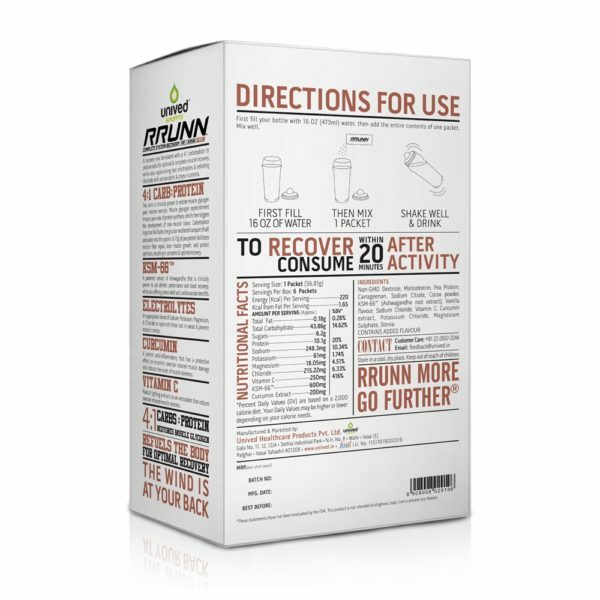 RRUNN™ Post is a pioneering recovery drink mix with the right ratio of carbohydrates to protein, along with the electrolytes, BCAAs, vitamin C, KSM-66™ and curcumin extract for muscle repair, muscle building, lowering fatigue, and eliminating cramping. Sports nutrition research has proven time and again that the window of up to 20 minutes after intense exercise – the ‘golden window of opportunity’ – is when the body is most accepting of nutrients to recover from strenuous exercise. Evidence shows that when carbohydrates and protein – two of the most important macronutrients – are ingested in the ratio of 4:1, they are utilized in the most effective manner towards the body’s recovery. RRUNN™ Post delivers these macronutrients for recovery by combining Dextrose & Maltodextrin (high GI carbohydrates) and plant-based pea protein isolate in the 4:1 ratio. Consuming multiple food sources for recovery after exercise can cause stomach distress. Additionally, the nutrients in these foods cannot be broken down immediately by the body, which means that you risk losing out on the 20-minute window. 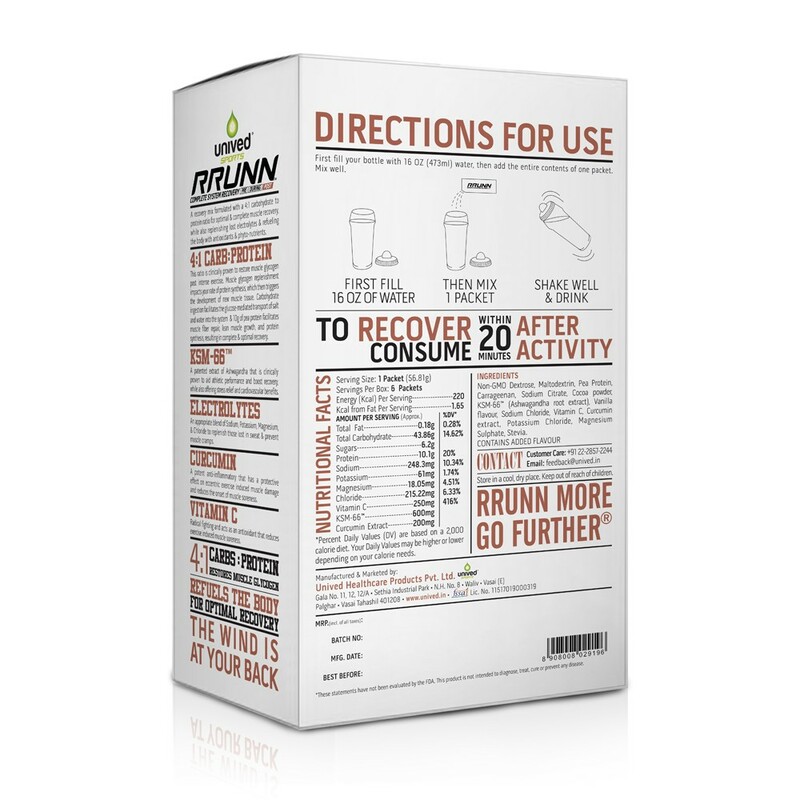 RRUNN™ Post recovery drink mix offers a concentrated, convenient source of all the nutrients you need for recovery, delivered to your body in a manner where they can be instantly broken down and utilized by the body. The carbohydrate in RRUNN™ Post stabilizes blood glucose levels and refuels the muscle glycogen lost during your endurance activity. This increase in muscle glycogen promotes the repair of muscle, and the development of new muscle tissue. RRUNN™ Post has plant-based pea protein, a source of the full-spectrum of branch chain amino acids (BCAAs) necessary for production of new protein in the body. The body does not naturally store these amino acids and hence, RRUNN™ Post supplements your system with the fundamental building blocks it needs for protein synthesis, complete tissue repair and growth, and recovery. Additionally, pea protein is fully digestible, making it completely available to your body for building new muscle. 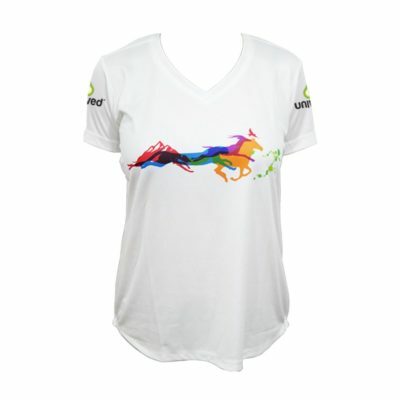 RRUNN™ Post restores the levels of sodium, potassium, magnesium, and chloride lost to sweat during your activity. Hydration levels of the body can remain affected up to 48 hours after exercise, and these electrolytes play an important role in regulating hydration across cells and major organs. Muscle growth and overall system recovery is aided by KSM-66™ – the most extensively studied Ashwagandha extract on the market. Clinically, it has been found that KSM-66™ produces 98.9% reduction in post exercise build up of serum creatine kinase levels indicating less degree of muscle damage. Thus, helping athletes recover after workingout and during continuous activity repetition. Athletes have also observed increased cardiorespiratory endurance, improved max resistance load and muscle recovery, while also offering stress relief benefits. The vitamin C in RRUNN™ Post reduces muscle soreness and acts as a potent antioxidant, to bring relief from cramps, aches, and stiffness. Curcumin extract is a potent and well-known anti-inflammatory. It curbs post exercise muscle damage and inflammation. Recovery is a big factor in determining performance and in preventing injury, which is why recovery nutrition should be a part of your overall fueling strategy. 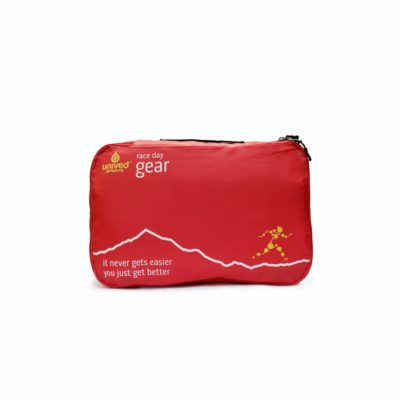 RRUNN™ Post is all you need to carry with you after a big race or training session to ensure that you are ready and primed for the next big challenge. Who should use RRUNN™ Post? 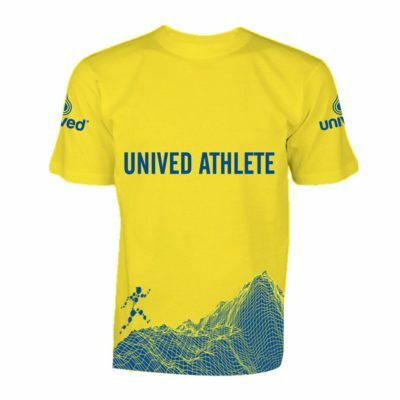 RRUNN™ Post is suitable for athletes of all ages, and across all endurance sports such as running, cycling, football, cricket, hockey, swimming, as well as demanding competitions such as marathons, ultra-marathons, long-distance running, triathlon, and other activities that test your physical and mental strength. 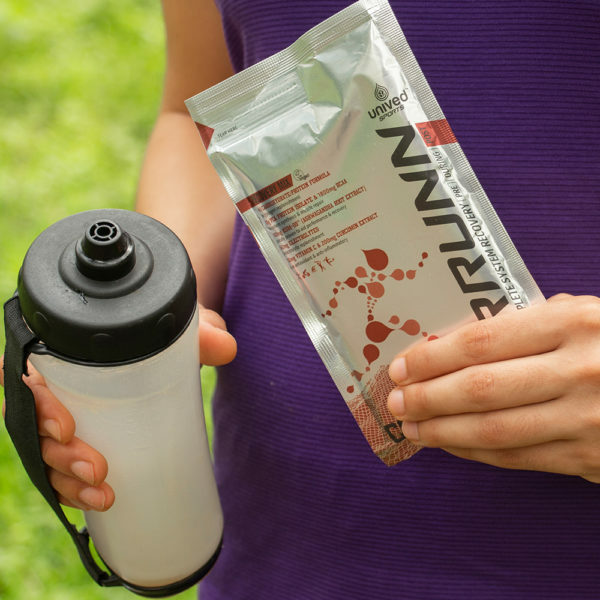 RRUNN™ Post is part of the RRUNN™ System, along with RRUNN™ Pre – Instant and Sustained Energy and RRUNN™ During – Hydration & Endurance. The three formulations of RRUNN™ – Pre, During and Post – are each scientifically calibrated to supply carbohydrates, electrolytes, endurance, & recovery supplementation to address the physical, mental, and physiological requirements of an athlete during every stage of an endurance activity. You can also incorporate RRUNN™ Endurance Energy Gel and RRUNN™ Electrolyte Salt Caps into your regimen. Non-GMO Dextrose, Maltodextrin, Pea Protein, Carrageenan, Sodium Citrate, Cocoa powder, KSM-66 (Ashwagandha root extract), Vanilla Flavor, Sodium Chloride, Vitamin C, Curcumin Extract, Potassium Chloride, Magnesium Sulphate, Stevia. 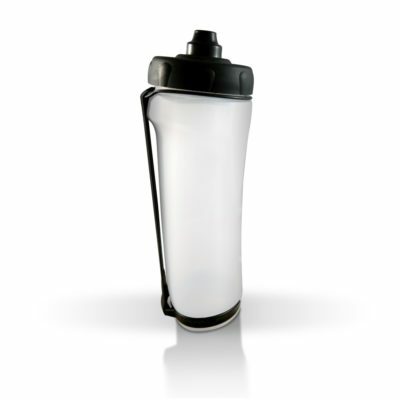 Mix 1 serving in 473ml (16 oz) of cold water immediately after your activity within the ‘window of opportunity’ of 20 minutes after your activity. Use in conjunction with Lean™ Pea Protein Isolate. 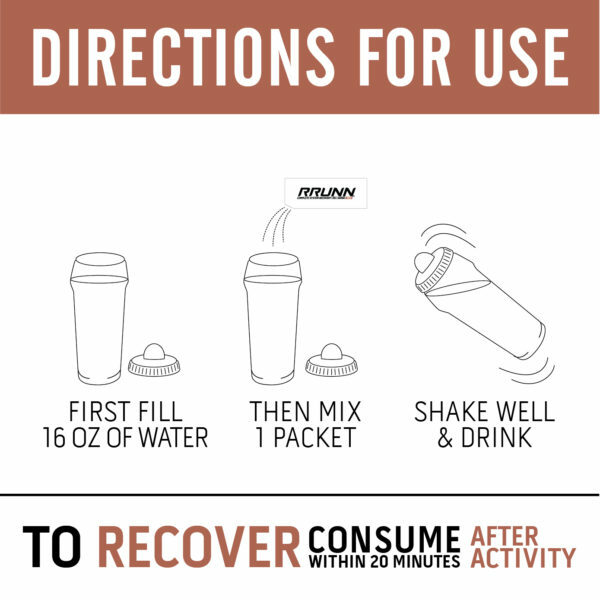 Why do I need to consume RRUNN™ Post – Complete System Recovery Drink Mix? Post-run, your muscles are low on glycogen, and are vulnerable to damage and soreness. At this stage, your body is also depleted of electrolytes and hydration. If the body is not supplied with the proper recovery supplementation within 20 minutes of completing your activity, it is susceptible to injury, muscle damage and fatigue. RRUNN™ Post delivers carbohydrates and proteins in the critical 4:1 ratio within the ‘window of opportunity’ of 20 minutes after your activity. This replenishes your muscle glycogen, lowers free radical damage, and promotes the growth of new muscle tissue. The vitamin C in RRUNN™ Post is an antioxidant that reduces muscle soreness, essential electrolytes rehydrate you, clinically proven KSM-66™ aids athletic performance and boosts recovery, curcumin extract helps reduce body inflammation. RRUNN™ Post is complete recovery supplementation that ensures you recover fully from your strenuous activity, resume training at your peak, and stay injury free. Why is the 4:1 ratio of carbohydrate to protein in RRUNN™ Post important? Several studies suggest that the ideal recovery supplementation should contain carbohydrates and proteins in the 4:1 ratio. The 4:1 ratio of carbohydrates to proteins in RRUNN™ Post recovery drink is scientifically proven to boost the levels of muscle glycogen, stimulate the growth of new muscle, reduce muscle damage, improve performance in subsequent exercises, and reduce the risk of injury. How much protein is in RRUNN™ Post? Why do I need to consume RRUNN™ Post within 20 minutes of finishing my activity? Research has shown that the 20 minute window after you finish your activity is when your body is most receptive to a complete recovery. It is within these 20 minutes that your muscles are the most primed to assimilate the nutrients that it needs to restore levels of glycogen, repair damaged tissue and build new muscle tissue. Consuming RRUNN™ Post recovery drink within this 20 minute ‘window of opportunity’ ensures optimal, scientific recovery. How much RRUNN™ Post should I consume after my activity? 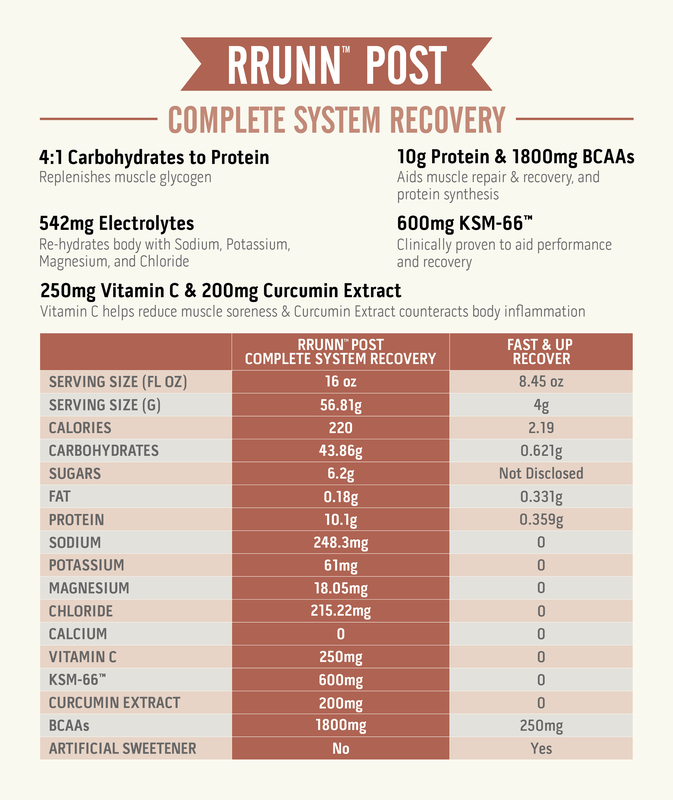 For optimal recovery and best results consume at 1 serving of RRUNN™ Post – Complete System Recovery Drink mix. We also recommend that you use Lean™ Pea Protein Isolate in conjunction with RRUNN™ Post. Ideally you should consume RRUNN™ Post immediately after your workout or within 20 minutes and within 45 minutes of your workout you consume 1 serving of Lean™ or you can opt to consume Lean™ Pea Protein Isolate at night before going to bed. Will RRUNN™ Post help with my post-run muscle soreness? Yes. RRUNN™ Post has vitamin C which is a potent antioxidant that reduces muscle soreness and curcumin extract that aids inflammation reduction. Will RRUNN™ Post help with muscle repair and growth? Yes. 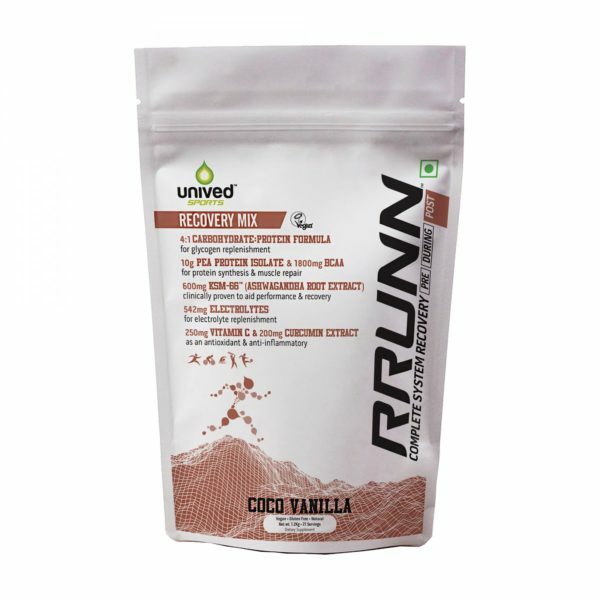 RRUNN™ Post recovery drink has pea protein which supplies the full profile of amino acids that your body needs to build new muscle tissue. When taken within the 20 minute window after your activity, RRUNN™ Post helps reduce muscle damage and promotes the growth of new muscle tissue. Does RRUNN™ Post contain Whey protein? No. Whey protein is derived from an animal source. 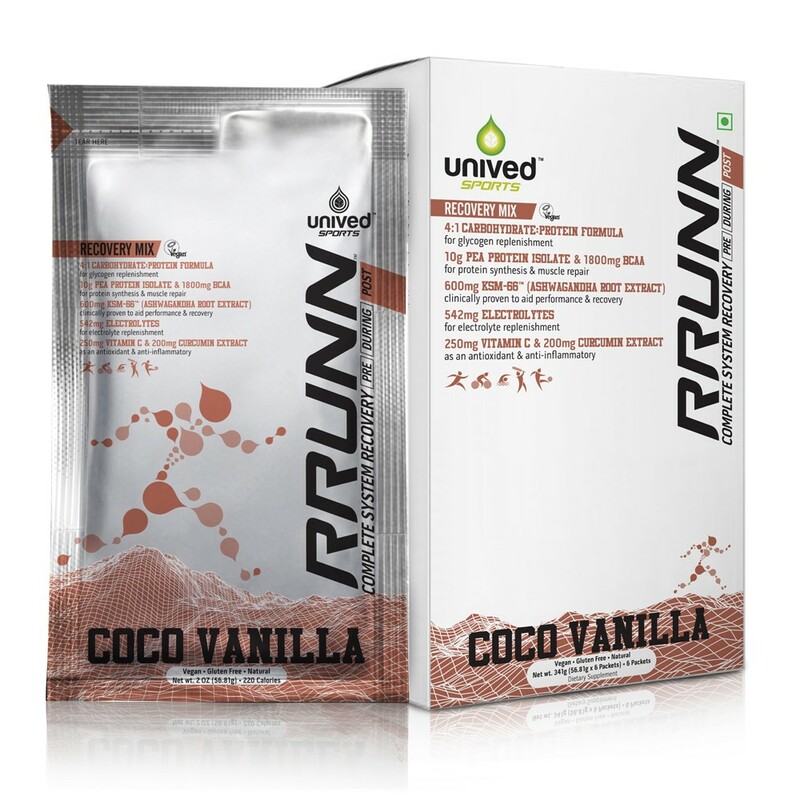 RRUNN™ Post is a vegan recovery drink mix, which means it does not contain any ingredients of animal origin. The protein used in RRUNN™ Post plant-based extracted from yellow peas. 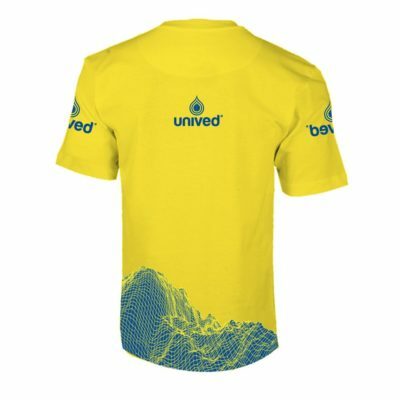 Why are the advantages of pea protein used in RRUNN™ Post? 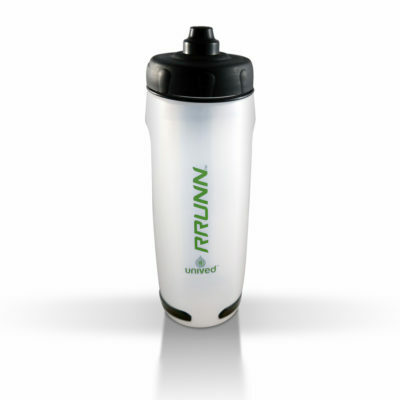 Pea protein is a vegetable protein, which makes RRUNN™ Post a vegan recovery drink. Pea protein also has high digestibility of 98% and a fast-intermediate digestion rate, which means this protein is highly and quickly available to the body towards the building of new muscle tissue. KSM-66™ is the most extensively studied and patented Ashwagandha extract on the market. It is clinically proven to aid athletic peformance and boost recovery, while also offering stress relief and cardiovascular benefits. Can I incorporate RRUNN™ Post into my training? Yes! In fact, we recommend that you do, so your body can acclimatize to it and you get the best results from RRUNN™ Post on race day. Is RRUNN™ Post suitable for Jains and vegans? Yes. 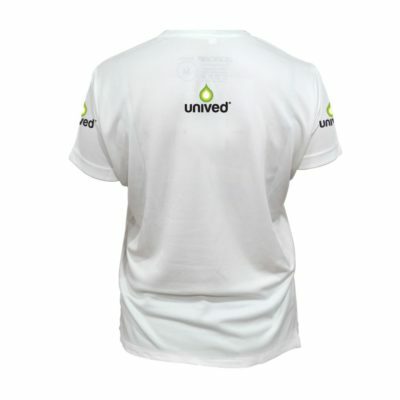 RRUNN™ Post is suitable for Jains and it is certified vegan by the Vegan society, UK. We do not add any animal ingredients and our products have not been tested on animals. Yes. RRUNN™ Post is gluten-free, which means it does not contain Gluten, which is the protein found in grains such as wheat and barley. Being gluten-free, RRUNN™ Post does not give you bowel issues and is easy on your stomach. Should I consume all RRUNN™ products together or can I consume them separately? 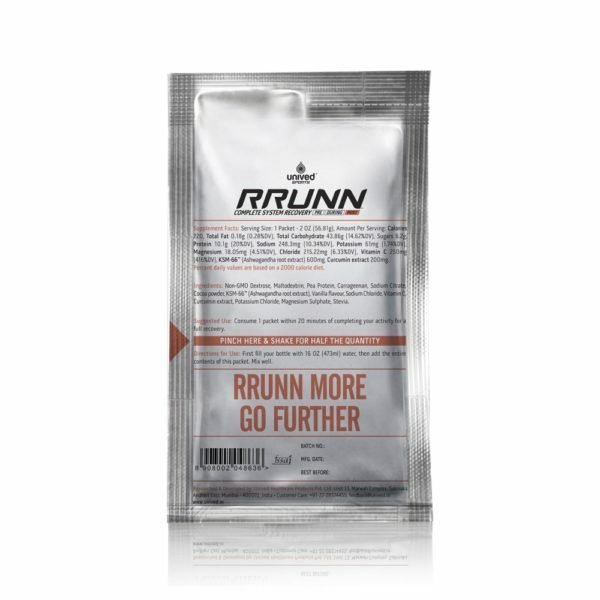 The three formulations of RRUNN™ – Pre, During and Post – have been designed as a system to support you from the start to the finish of your endurance activity. The RRUNN™ products are specifically designed to meet the different needs of your body at the different stages of your activity. We recommend that you consume them together, so you get optimal results from the RRUNN™ System. 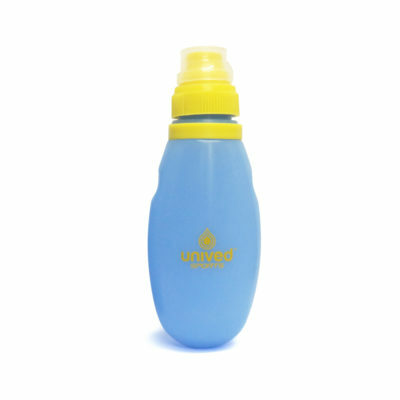 You can always tailor the intake of these products, depending on your activity. For e.g. 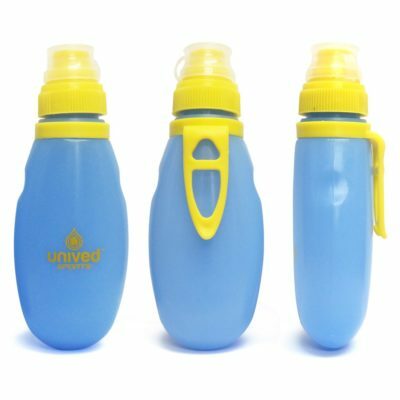 for activities of shorter durations or lesser intensity like a 5k race, you may feel that RRUNN™ Pre alone covers your hydration needs. That being said, incorporating all the three RRUNN™ products into your training and performance regimen will ensure that these products give you their peak performance, so you can tap into your full potential. Does RRUNN™ Post contain any banned substances? 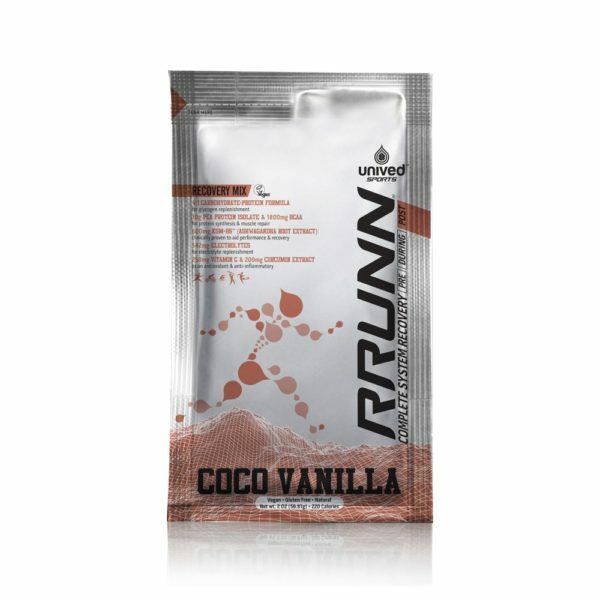 As the RRUNN™ range has been formulated in accordance with the WADA (World Anti-Doping Agency) guidelines, RRUNN™ Post does not contain any banned substances. However, please note that WADA does not offer any certification or written confirmation of the same. 1. Goldberg, Paul. “Recovery nutrition for athletes.” NCSA performance training journal 5 (2004): 13-15. 2. Ivy, John L. “Regulation of muscle glycogen repletion, muscle protein synthesis and repair following exercise.” Journal of sports science & medicine 3, no. 3 (2004): 131. 3. Ivy, John L., Harold W. Goforth Jr, Bruce M. Damon, Thomas R. McCauley, Edward C. Parsons, and Thomas B. Price. “Early postexercise muscle glycogen recovery is enhanced with a carbohydrate-protein supplement.” Journal of Applied Physiology 93, no. 4 (2002): 1337-1344. 4. Niles, E., T. Lacowetz, J. Garfi, and W. Sullivan. “C. Smith, J., P Leyn, B., & A Headly, S.(2000). Carbohydrate-Protein Drink Improves Tieme to exhaustion After Recovery from endurance Exercise.” JEPonline 4, no. 1: 45-52.